Life for the typical person living in the Aztec Empire was hard work. As in many ancient societies the rich were able to live luxurious lives, but the common people had to work very hard. The family structure was important to the Aztecs. The husband generally worked on a job outside of the home as a farmer, warrior, or craftsman. The wife worked at home cooking food for the family and weaving cloth for the family's clothes. Kids attended schools or worked to help out around the house. What type of homes did they live in? Wealthy people lived in homes made of stone or sun-dried brick. The king of the Aztecs lived in a large palace with many rooms and gardens. All of the wealthy had a separate bathing room that was similar to a sauna or steam room. 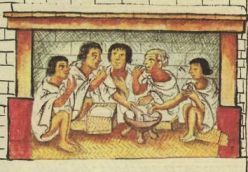 Bathing was an important part of the Aztec daily life. Poor people lived in smaller one or two room huts that had thatched roofs made from palm leaves. They had gardens near their homes where they would grow vegetables and flowers. Inside the house, there were four main areas. One area was where the family would sleep, generally on mats on the floor. Other areas included a cooking area, an eating area, and a place for shrines to the gods. What did the Aztecs wear for clothes? The Aztec men wore loincloths and long capes. The women wore long skirts and blouses. Poor people generally wove their own cloth and made their own clothing. It was the responsibility of the wife to make the clothes. There were rules in Aztec society regarding clothing. These included detailed laws specifying what clothing decorations and color different classes of people could wear. For example, only nobles could wear clothing decorated with feathers and only the emperor could wear a turquoise colored cloak. The main staple of the Aztec diet was maize (similar to corn). They ground the maize into flour to make tortillas. Other important staples were beans and squash. Besides these three main staples the Aztecs ate a variety of foods including insects, fish, honey, dogs, and snakes. Perhaps the most valued food was the cocoa bean used to make chocolate. All Aztec children were required by law to attend school. This even included slaves and girls, which was unique for this time in history. When they were young, children were taught by their parents, but when they reached their teens they attended school. Boys and girls went to separate schools. Girls learned about religion including ritual songs and dancing. They also learned how to cook and make clothing. Boys usually learned how to farm or learned a craft such as pottery or feather-work. They also learned about religion and how to fight as warriors. Aztec children were instructed early in life about manners and correct behavior. It was important to the Aztecs that children did not complain, did not make fun of the old or sick, and did not interrupt. Punishment for breaking the rules was severe. Most Aztec men got married around the age of 20. They typically did not choose their wives. Weddings were arranged by matchmakers. Once the matchmaker chose two people to be married, the families would both need to agree. The Aztecs enjoyed playing games. One of the most popular games was a board game called Patolli. Just like with many board games today, players would move their pieces around a board by rolling dice. Another popular game was Ullamalitzli. This was a ball game played with a rubber ball on a court. Players had to pass the ball around using their hips, shoulders, heads, and knees. Some historians believe the game was used in preparation for war. The elderly members of the family were well taken care of and respected in Aztec society. The punishment for breaking a law regarding clothing was often death. The word chocolate comes from the Aztec word "chocolatl". The name for the ball game Ullamalitzli comes from the Aztec word "ulli" which means "rubber". The sons of nobles went to a separate school where they learned advanced subjects such as law, writing, and engineering. The students at these schools were actually treated rougher than at the commoners' schools. Slaves were generally treated well and could buy their way out of slavery.